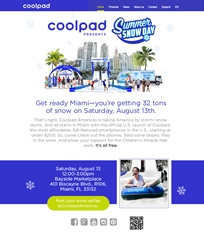 Coolpad – a global, top-10 smartphone manufacturer – today announced plans for delivering 32 tons of snow to downtown Miami as part of its “Summer Snow Day” promotion that will celebrate the company’s global launch and efforts to expand its market presence in the United States. This exciting event is scheduled from noon to 3 p.m. on Saturday (Aug. 13) in front of the Bayside Marketplace at 401 Biscayne Blvd. in Miami. "Coolpad is a global smartphone brand known for making affordable, full-featured smartphones that do not sacrifice the functionality or performance that people want to see in their smartphones,” said Brandy Kang, CEO of Coolpad Americas. 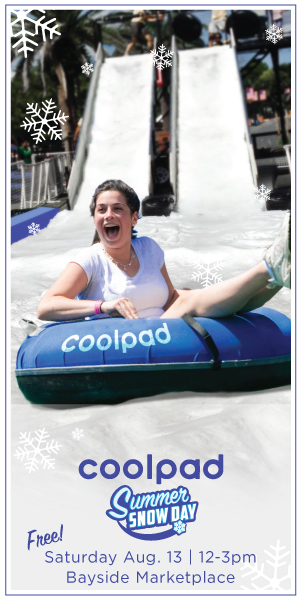 Coolpad – a global, top-10 smartphone manufacturer – today announced plans for delivering 32 tons of snow to downtown Miami as part of its “Summer Snow Day” promotion that will celebrate the company’s global launch and efforts to expand its market presence in the United States. Coolpad invites the public to come out and play in the snow during this unique event and learn more about the company and its line-up of high-power, affordable smartphones. This exciting event is scheduled from noon to 3 p.m. this Saturday in front of the Bayside Marketplace at 401 Biscayne Blvd. In addition, Coolpad will hold a special press event at 11:45 a.m. where company officials will host City of Miami Mayor Tomas Regalado and representatives from Miami Children’s Health Foundation to make a special donation to support the Foundation’s efforts to improve pediatric care in the area. Coolpad was recently named to Forbes Asia’s Fab50 list as one of China’s largest 4G smartphone producers and vendors. Coolpad was founded in 1993 and has been a cellphone technology leader for over 20 years. Coolpad launches over 50 smartphones a year with revenues exceeding $1.8 billion in 2016 globally. Coolpad believes technology should be simple in the way that it enhances every aspect of your life, and so instinctive that it becomes a natural part of you. For more information, please visit https://coolpad.us.